The Document Foundation company has presented to the public the next stable version of the open office suite LibreOffice for platforms Windows, Mac and Linux. The developer presents the LibreOffice 4.1 solution as the most versatile office suite and the most viable alternative to Microsoft Office. In version 4.1, a new sidebar appeared (similar to what was implemented in OpenOffice 4.0). – means of mathematical calculations. We recently wrote about the fact that the Document Foundation has been releasing updates for LibreOffice line 3.6.x and advised all fans of this product, go to the branch 4.x The next release of the new line has a serial number 4.1, and provides a comprehensive set of enhancements in terms of compatibility documents. In addition, LibreOffice 4.1 includes many new features, including support for the introduction of fonts in all applications, the package and the option “Photo Album” in the program Impress. Improved compatibility of documents in LibreOffice 4.1 has been made possible thanks to completions filters exports and imports, covering the latest formats Microsoft OOXML, as well as the older Office extensions and RTF. The result is the preservation of the original structure and content of documents that are opened in the corresponding application package LibreOffice. In the release, LibreOffice 4.1 provides support font embedding in documents applications Writer, Calc, Impress and Draw, and the Calc is available to import and export of new features in Excel 2013. Also, now you can add Calc type Stepped Lines in line and bar charts. In Writer, there is support for the rotation of graphic objects by 90 degrees, and has been improved handling of footnotes and comments in the footers. A new option “Photo Album” in Impress has simplified the process of creating a slide show of images. Finally, the new assembly provides experimental support for the side panel, which is already implemented in competing products Apache OpenOffice and Lotus Symphony. However, the developers of The Document Foundation refused to plagiarism and added to the side panel of your own tools – support for changing the size of the structures. 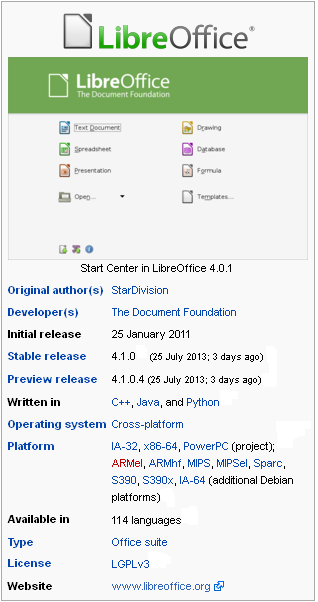 As for the correction of “bugs”, they in LibreOffice 4.1, there are about 3,000. Owning a Mac-s should be remembered that in this release are no longer supported processors PowerPC. A Windows platform users will soon be offered a portable version of the package – LibreOffice Portable 4.1.